Straightforward, intense, totally rampaging. This is how grindcore is performed by NOXA from Indonesia!!! I believe this exotic massage will be a great refresher for you!!! 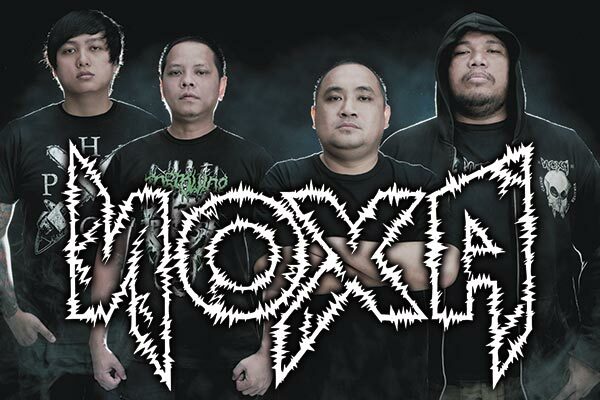 Noxa was formed mid March 2002 by Oxen (drums) and Ade (Guitar). we decided to play Straight Forward old school GrindCore with socio-political, love & hate story, humanity lyrics, etc. from the first we started to cover Nasum (Swe) songs from inhale-exhale album, and of course some of old Napalm Death (UK) songs. Four of us was Degree from Sahid University in Jakarta-Indonesia. Graduated from the same University. Know each other almost 10 years and always jamming & sessions in some local gigs around the years. Oxen & Ade decided to make a band, the oxen call Tonny (vox) and Dipa (Bass) to joined the band. Oxen, offered to all member to call this quartet NOXA, it means " All things who can be killed and dangerous for your health, body, even your life if you consume it over from the dose" after all the band members agree to use it, so we used NOXA till Now. Early 2004, we decided to make some new materials in jamming studios, finally we recorded our 2nd album, and we enter DE Studio for drums tracked only. And guitars, bass, vox tracked at Coliseum Studio Jakarta. Cipta Gunawan Moehammad our 1st engineer & Jorghi Soebagio 2nd engineer helped us for this recording session. Mixed & mastered the 2nd album at Stonedeaf Studio, New York City - USA. With our best friend Gunawan helped us to make this album done for all recording stuff. this album contains 31 songs, 46 minutes. Cool design by Tonny Tandun from T's Toy Company. This album called Grind Viruses" oxen made the title of the album. October 1st 2006, We release our 2nd album title Grind Viruses " under NOXA RECORDS. 2,000 copies only!!! We tried to mix & improve our music with D-beat style, hope that D-beat Grindcore music has become a mass messages, mass music, mass virus to make the world even, level, and equal in the music industry. NOXA "Grind Viruses" album now release with Stay Heavy Record Finland. July 2009 Noxa got new drummer Alvin he replace Robin who died January 17 2009 he got accident with motorcycle.